Daughter of Ghana’s first President will attend the XIII World Summit in Warsaw. 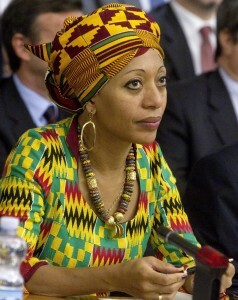 The social activist Samia Nkrumah is a daughter of Ghana’s first President Kwam Nkrumah and the first woman in Ghana’s history to lead a political party: Convention Peoples’ Party established by her father to promote the idea of independent Gold Coast, the British colony which in 1957 it became independent Ghana. Considering herself heir to the legacy of her father, one of the creators of the idea of Pan-Africanism, Samia Nkrumah claims that his vision of Ghana and Africa called ‘Nkrumaism’ is as valid today as it was in the 1950s and 1960s. ‘Achieving political and economic liberation, social justice and national and continental unity including the African Diaspora are yet to be realized. It is our task today to continue from where Nkrumah left, while remaining flexible as we adapt to changing circumstances’, she says in an article dedicated to her in ‘Huffington Post’ of 2009 titled: ‘The New Mandela is a Woman’. She cofounded the Africa Must Unite Association which aims at implementing the vision of Ghana’s first President: ‘Educating people to be non-violent and democratic, with respect for human rights and (…) economy’. The Association aims at levelling disproportions resulting from poverty and social exclusion; it supports healthcare, sustainable environment, educational, and infrastructural projects. The Association founded by Samia Nkrumah was implementing the project of supplying potable water to the residents of one of the poorest zones in Ghana, Jomoro, and also supported local schools there, often devoid of any basic equipment. This activity strongly appealed to the organizers of annual Nobel Peace Laureates Summits, namely the Permanent Secretariat which for many years supported the construction of wells and schools in this poor region of Ghana bordering on the Ivory Coast struck by civil war. Talking to ‘Huffington Post’ Samia Nkrumah emphasizes that it is precisely the solution of basic challenges facing Jomoro residents, such as lack of electricity, or running and potable water, as well as lack of schools, which is the precondition for her country’s development. ‘Our father’s idea of Pan-Africanism was not restricted to a political project, but his vision also embraced the economic as well as the cultural aspects of our development’, she argues. As a child Samia Nkrumah was forced to leave Ghana together with her mother and brothers after her father had been overthrown in a coup d’état in February 1966. She lived for many years, in, e.g., Great Britain where he was employed at the London Branch of the Bank of India; Egypt where she worked as a journalist for the ‘Al-Ahram’ paper; and in Italy. She herself says that she used to live an ordinary life, with her husband, an Italian, and a son, never thinking of returning to Ghana, and certainly not getting involved in politics, until she met her father’s literary executrix June Milne who lived in England. In the 2008 election running in the Western Region constituency of Jomoro she was elected Ghana’s Parliament deputy and won the only seat for the Convention People’s Party, initially dissolved by the junta after the coup d’état, which, however revived 30 years later. In September 2011, she was elected CPP Chair, thus becoming the first woman ever to lead a political party in Ghana. She was not, however, re-elected to the Parliament in 2012. Samia Nkrumah has been greatly appreciated by her countrymen for her authentic commitment, passion, competence, and courage stemming from her unwavering faith in the rightness of her father’s legacy. She embodied a major hope for all those wishing to revive the Convention People’s Party. At the same time, commentators observe that her holding a prominent position has demonstrated to what extent women in Ghana are marginalized in comparison with such countries as South Africa, Ruanda, or Uganda, all of which had introduced a preference system meant to increase the number of women in their Parliaments. Samia Nkrumah participated in the previous 2012 Summit of Nobel Peace Laureates in Chicago as the only representative of Ghana. This provided her with an opportunity to exchange views with, e.g., former US Presidents: Jimmy Carter and Bill Clinton, as well as with the former South Africa’S President Frederik de Klerk who won his Nobel Peace Prize in 1993 jointly with Nelson Mandela. In her Chicago address she pointed to the essential need to eliminate the contradiction reading: ‘Africa is rich, yet Africans poor’. ‘We have regained political independence in order to rebuild our economies, yet we are still awaiting to achieve that’, she emphasized. She elaborated on the latter idea during a recent debate on Pan-African Development Programme. Judging that Ghana could still implement her father’s dream, she claimed this would require a radical rejection of the economic policies implemented by subsequent governments since the 1980s. ‘Nkrumah’s axis of economic policy was to make Ghana productive and increase the manufacturing capacity of the country, as this is the only way of providing jobs to people’, she said warning against an excessive reliance on foreign aid.